On the Opportunity screen, you can click on the 'Deposits' tab on the right hand side to add, remove, and view the deposits associated with the opportunity. If deposit products have not been enabled by your administrator(s), you will not be able to view the 'Deposits' tab or add deposit products until a deposit product is enabled. It is important to make sure that all deposits added to an opportunity are new deposits being brought in. All currently held deposits and their benefit to this relationship can be viewed on the Relationship Impact Tab and you can see a summary of the Relationship Impact screen in the footer at the bottom of the screen. Click 'Add' and you will see a list of possible Deposit Products that you can add to the Opportunity. This list is completely configurable and should represent the types of Deposits that you typically price at your institution. To begin pricing a deposit, just select the applicable Deposit Product name from the list. Once you have selected the specific Deposit Product you would like to add, complete the fields indicated in order to arrive at the average annual Net Income and return for that deposit. The Balance field should represent the average expected collected balance. If the deposit is interest-bearing enter the rate your bank pays for that type of deposit in the Rate field. If the deposit is a time-deposit such as a CD, enter both the term and rate in the designated fields. Also, note that for a time-deposit you can specify the Origination Date for the term. 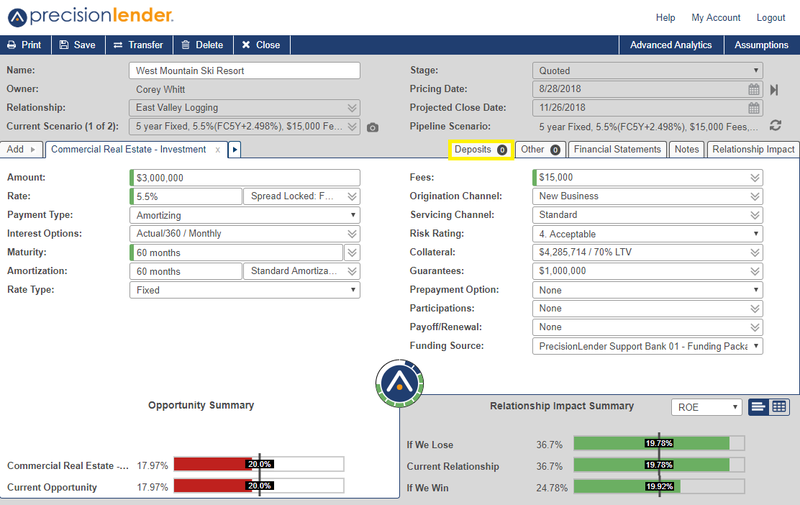 PrecisionLender will always default to the Pricing Date of your opportunity; however, you can change the deposit Origination Date by clicking on the calendar icon and selecting the appropriate date.